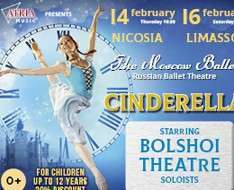 Russian Ballet Theatre presents: Ballet CINDERELLA . All children must have entry ticket. “Cinderella” by Sergei Prokofiev in the choreographic version by ballet master of Moscow’s theater Anatoly Emelyanov. It has long been thought that the best subjects for ballets are fairy tales. The story by Charles Perrault is Cinderella, one of the most beloved and popular fairy tales of all time. The reason for this is sincerity, an interesting plot and, of course, a wonderful manifestation of magic in the life of an ordinary person. The performance begins with a scene in the father’s house of Cinderella. The evil stepmother and her two daughters are constantly fighting and swearing. Cinderella is teased and forced to work in the house. She thinks about her dead mother, trying to find comfort with her father, but he is unable to do anything for her. A beggar woman comes to the house. The sisters tell her to go away, but Cinderella secretly invites the old woman to rest and eat. Meanwhile, the stepmother and sisters prepare for the ball at the palace. Finally, the stepmother and sisters leave. Cinderella is left alone. She dreams about the ball and dances alone. The beggar woman returns, only this time as a beautiful fairy who will reward the girl for her kind heart. With the help of the fairies of the seasons, Cinderella gets dressed up for the ball. But, the fairies have a condition - at midnight, she must leave the ball. The stepmother and sisters come to the palace. The royal ball is in full swing. Guests are performing the mazurka. The sisters attract everyone's attention with their clumsiness. The prince arrives, and after him a mysterious stranger follows - It is Cinderella. The prince is astonished by her and invites her to dance. The sisters try to attract the prince’s attention, but fail. The prince won’t leave Cinderella. They don’t notice how time passes. Suddenly, the romantic ball is interrupted by the clock. It is midnight. Cinderella runs away from the ball, losing her crystal shoe, that later the prince finds. The colorful story, combined with the magical music of Prokofiev is loved not only by one generation of children and adults, it allows you to dive into a real fairy tale and believe in miracles!